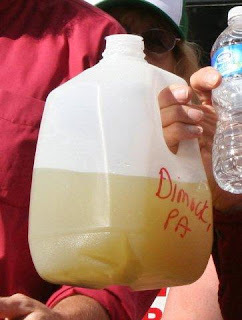 Just ten days ago, on July 19, AP reported that fracking chemicals didn't contaminate drinking water. That article was supposedly based on a "landmark federal study on hydraulic fracturing" conducted by the Dept. of Energy at their National Energy Technology Lab (NETL). 1. The study, which has been going on for nearly a year, is incomplete. In fact, on the same day that AP broke its story, NETL released a statement to the press noting that they are still in the "early stages" of this ongoing study. "While nothing of concern has been found thus far, the results are far too preliminary to make any firm claims." Which seems to be what the AP article was trying to do: make firm claims. Claims that fracking doesn't pollute groundwater would be great news for the gas industry - and hundreds of landowners who'd like to lease their land on the chance of getting rich off gas. 2. The more important problem is that the study is based on one single well. A well that the gas drillers chose, and allowed DOE researchers to use in their study. Not only is the sample size too small but, as Duke University scientist Rob Jackson pointed out, the drilling company may have consciously or unconsciously taken extra care with that particular site, since they knew it was being watched. Jackson, who was not part of that study, makes an important point: this study was neither representative nor unbiased. A true scientific study is designed to avoid sample bias (such as a drilling operator choosing one well over another because it has fewer problems). And a sample size of just one... the less said, the better. One week to the day of the AP report, scientists at the University of Texas at Arlington released news that their peer-reviewed study of 100 private water wells in and near the Barnett Shale shows elevated levels of contaminants including arsenic, barium, selenium, and strontium at levels exceeding EPA's maximum contaminant limit. One day after news of the UT study was released, the LA Times reported that EPA may have curtailed their investigations of contaminated water in Dimock, PA and Pavillion, WY prematurely due to political pressure. Seems some of the PA staffers in the agency had data showing that there were contaminants in local water wells and had lobbied their superiors to continue with the study. Meanwhile, U.S. Rep. Thomas Reed, from upstate NY which sits atop the thin edge of Marcellus shale, recently testified that the biggest threat to Marcellus Shale development isn't the spills, broken casings, or methane migration - it's the anti-fracking movement. Way back in December people - lots of people from all walks of life and all sides of the fracking issue - sent comments to NY Department of Environmental Conservation (DEC) regarding proposed fracking regulations. They had one month to comment on 100-plus pages of proposed regulations, and then, commencing January 12th, DEC would read through the comments and continue the rule-making process. 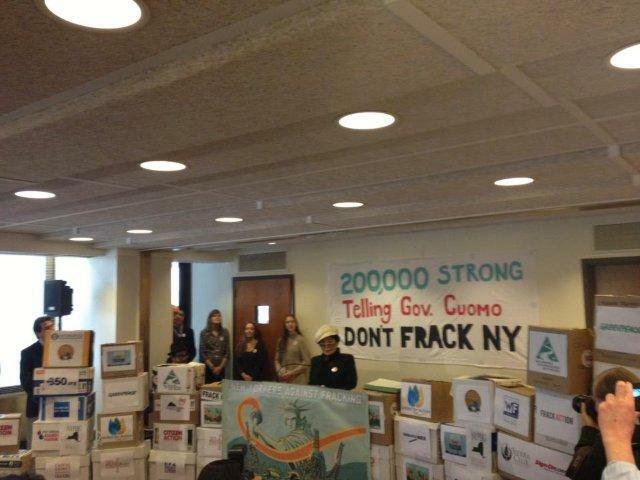 On January 11, environmental groups presented DEC with 200,000 comments. Landowner groups and drilling advocates also responded with thousands of comments. And what did DEC do with those boxes and boxes of comments? Nobody knows. What they didn't do was complete the rule-making process by the March deadline. Now, half-a-year after receiving the comments, people are wondering: did DEC even read them? Did they file them? Did they toss them in the recycling bin unread? About that health review ... apparently it's on summer vacation, because it still hasn't been completed. So now NY has no fracking regulations and, apparently, no energy to respond to the comments that citizens submitted to their government. They also don't have the health review - and no timeline for when to expect one. Originally a health review was expected sometime last January or February. No progress. No transparency. And no comment from Cuomo. Assemblyman Robert Sweeney, who chairs the Assembly Environmental Conservation Committee, told the press that transparency of the review process has been "insufficient." He thinks DEC has an obligation to respond to the comments.